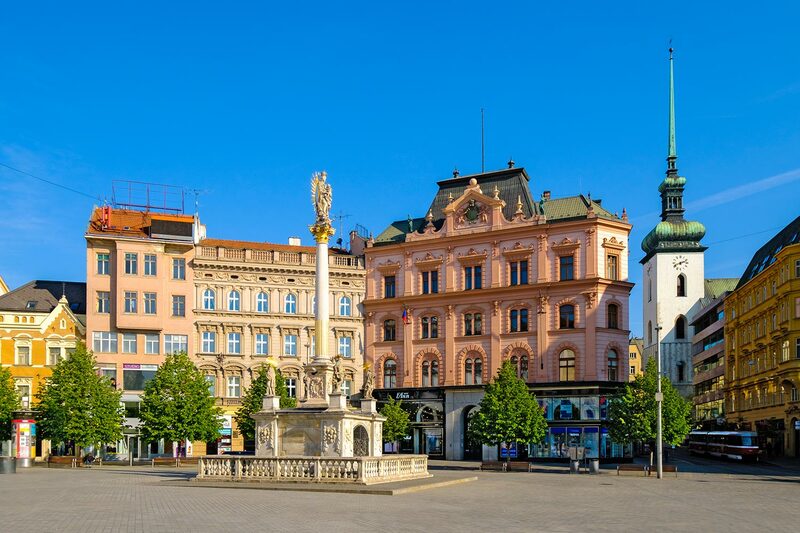 Brno is a city in Moravia, relatively close to Czechia’s borders with Austria and Slovakia. It is the country’s second largest city after Prague and the largest city of Moravia. It was the capital of Moravia between 1641 and 1948. Nowadays, Moravia no longer exists as an administrative entity and therefore it does not have an official capital. 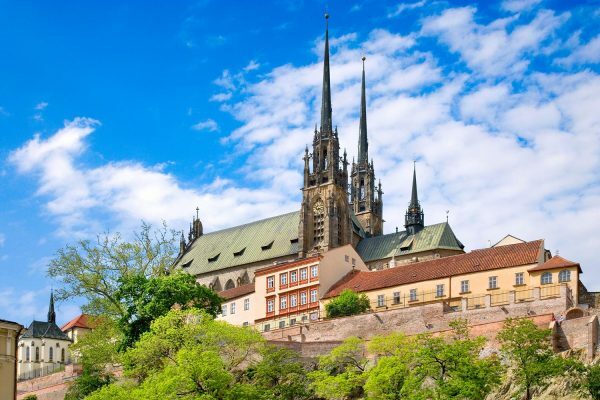 It does, however, exist as one of the three historic Czech lands (besides Bohemia and Czech Silesia) and Brno can be considered its traditional capital. 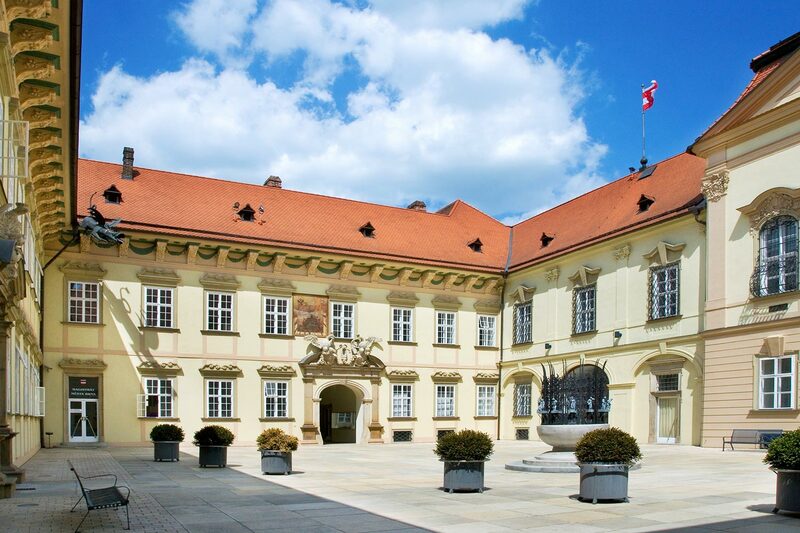 Brno is internationally famous for its exhibition center. It was opened in 1928 and belongs to the largest exhibition venues in Europe. Every year about 50 trade fairs and other events are held at the Brno Exhibition Center. More than 1 million visitors attend these events. 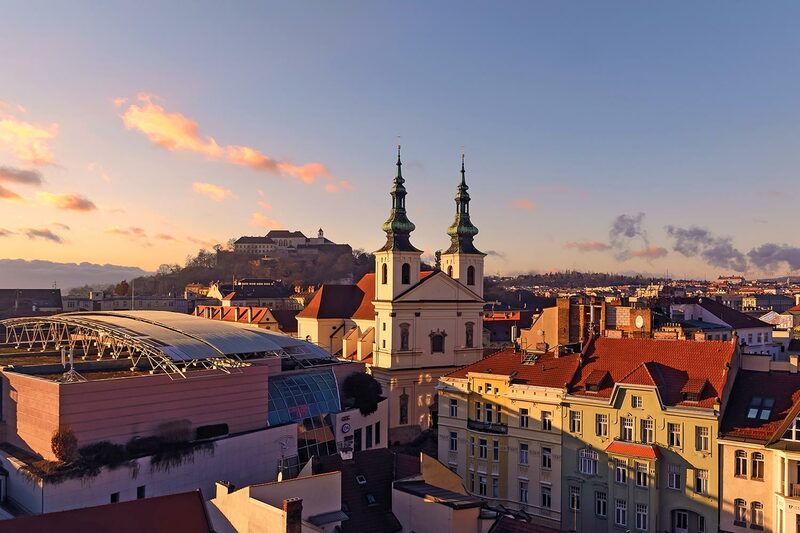 Prague is the official capital of the country, but it cannot compete with Brno in terms of trade fairs. Therefore, the Moravian city is sometimes called “the capital of trade fairs” (hlavní město veletrhů). Where to stay in Brno? Have a look at these excellent hotels and check the availability. Flats & Hostel Mitte is a high quality hostel in the downtown, within walking distance of the train station. Inexpensive and good. Check the price and availability. 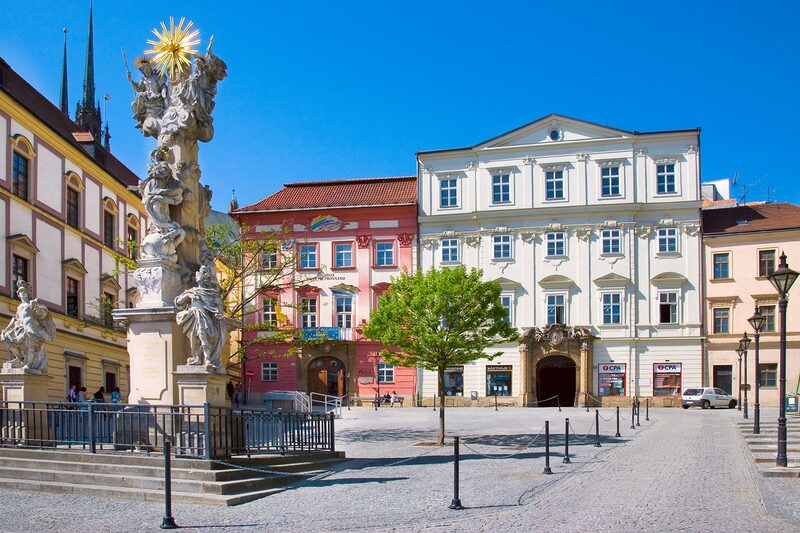 Hotel Cyro is a very good 3-star hotel in the centre of Brno, within walking distance of the cathedral and Špilberk Castle. Check the price and availability. 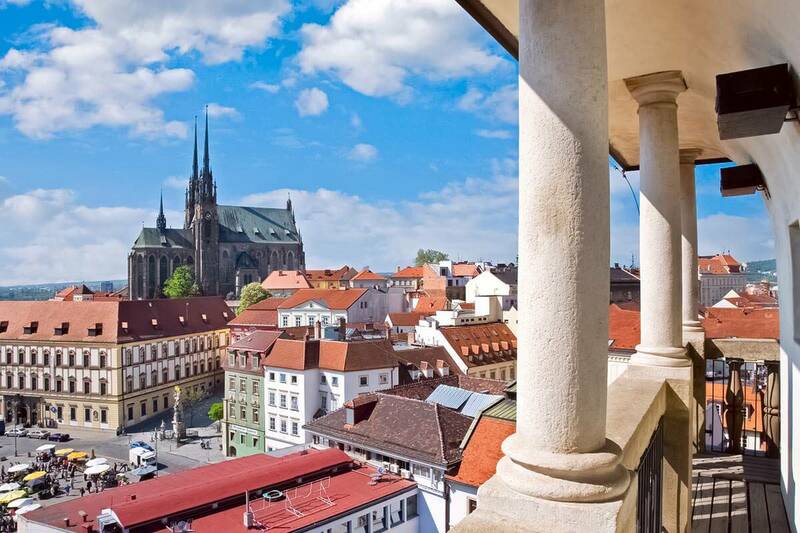 Barceló Brno Palace is an excellent 5-star hotel in the very centre of Brno. Czechia generally offers great value for money, so the price of luxury may surprise you. Check the price and availability. Trade fairs are not the only reason to visit Brno. The city boasts quite a large number of architectural landmarks and enjoys a rich cultural life. 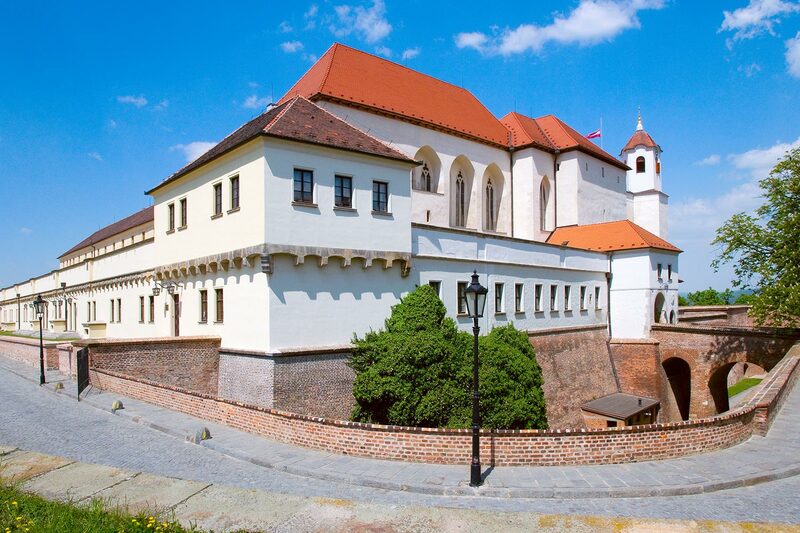 Špilberk Castle is one of the main landmarks dominating the cityscape of the Moravian metropolis. It was built on top of a hill of the same name in the 13th century. Nowadays, Špilberk is owned by Brno City Museum. It is a great tourist attraction and in the summer months it serves as the venue for many events, e.g. the Summer Shakespeare Festival. The Cathedral of Saints Peter and Paul is another major landmark of Brno. It was built on Petrov hill in the center of the city. Because of its location and height, it dominates the city skyline (along with Špilberk Castle). The cathedral’s facade and towers are Neo-Gothic, while the interior is predominantly Baroque. Villa Tugendhat is a pioneering example of modernist architecture in Europe. It was designed by the German architect Ludwig Mies van der Rohe and built on Černopolní Street between 1928 and 1930. In 2001 Villa Tugendhat was inscribed by UNESCO in the World Heritage List. After the Lednice-Valtice Area, Villa Tugendhat is the second World Heritage Site in the South Moravian Region. Brno Ossuary is located underground, partially under the Church of St. James (Kostel svatého Jakuba Staršího). It is considered the second-largest ossuary in Europe. It is estimated that over 50,000 people were buried there in the 17th and the 18th centuries. The ossuary was forgotten for a long time. In 2001, a team of archaeologists discovered it while conducting excavations before the renovation of the Jakubské square. Since 2012, the Ossuary of St. James’ Church has been open to the public. Opening times and ticket prices can be checked here. The international airport Brno–Tuřany (BRQ) is located approx. 7.5 km (4.66 mi) from the city center. However, the number of destinations served is somewhat limited. At the time of writing, there are regular flights to London (Luton/Stansted), Eindhoven and Munich. There are many more seasonal charter flights to popular holiday destinations in southern Europe and Turkey. Depending on your point of origin, more convenient may be flying to one of the nearby airports and from there getting to Brno by rented car, train or bus. There are several major airports within reasonable distance from the city: Prague PRG (226 km/141 mi), Vienna VIE (188 km/117 mi) and Budapest BUD (354 km/220mi). Also Bratislava BTS (142 km/88 mi) might be an interesting option, although it doesn’t offer as many connections as the other airports mentioned above. Brno Day (Den Brna) is held every year on Friday and the following Saturday which are closest to August 15th. It celebrates the successful defense of the city against attacking Swedish forces in 1645. You will have the opportunity to see people parading in historical costumes from that era, attend concerts and visit a fair. Špilberk International Music Festival is organized yearly by the Brno Philharmonic in the second half of August. It is an open-air event, held in the beautiful scenery of Špilberk Castle.